The days leading up to the first day of university classes can be nerve wracking. New classroom environments, unfamiliar professors and different expectations can make transitioning to college a challenging experience for students, particularly freshmen. To ease the transition from high school to a university setting, the University of Houston-Downtown (UHD) offers First-Time-in-College (FTIC) students an early welcome to campus with Gator Gateway, an orientation experience aimed at preparing students for life as a UHD college student. Mandatory for all incoming freshmen, Gator Gateway—uniquely tailored to each students' college academic major—is facilitated weeks before fall classes begin. And through the course of this four-day program, students will get better acquainted with all that UHD has to offer while making new friends, meeting faculty and staff, and settling into their new community. Students will also participate in numerous activities and events, including informative and interactive sessions. In addition, students will get a look inside real UHD college classes through a simulated classroom experience. They also will learn tips for success, and participate in an actual UHD community service-learning project. Last week, the first round of students from the College of Public Service (CPS) and the College of Humanities and Social Sciences (CHSS) concluded Gator Gateway. They participated in orientation sessions such as Sports and Fitness Boot Camp, Love Your Library, and Gators Engaged - Service in the Community, in which students made hygiene care packages for recently released inmates. "This was truly a transformative experience—as it was informative and insightful," said College of Public Service freshman Jaylyn Glenn. "I made new friends within my major, and the student leaders were very helpful with helping us navigate throughout campus. Having experience orientation, I feel much more confident and comfortable about the first day of classes." 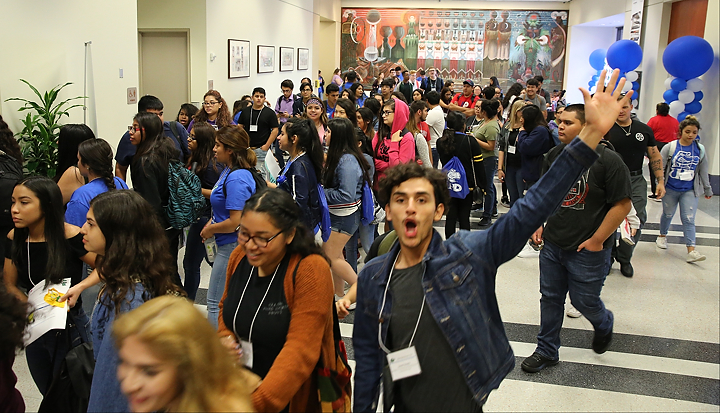 On opening day, CPS and CHSS students were warmly greeted by UHD President Dr. Juan Sánchez Muñoz, who offered encouraging words. "Don't let anything interfere with your education, and don't let anything compromise your future," said Muñoz. "This country and this state needs you… Texas needs you, and Houston needs you. They need you educated, committed, focused and willing to sacrifice for others. We're going to do everything possible to ensure that you will be successful and graduate from UHD. When you succeed, UHD succeeds. We are all about success." Similar events for the Marilyn Davies College of Business, the College of Sciences and Technology and Multidisciplinary/Honors/International​ students will follow in the upcoming weeks. Marilyn Davies College of Business' students will attend Gator Gateway July 24 through 27, with College of Sciences and Technology students kicking off their orientation July 31. Students identified as honors, international, and undecided majors will attend the multidisciplinary week Aug. 7 through 10. Tuesday - Wednesday: 8 a.m. to 3:30 p.m.
Thursday: 8 a.m. to 3 p.m.
Gator Gateway is part of a multi-tiered student success initiative referred to as #UHD2021. The initiative includes a two-part orientation experience, "Gator Ready" and "Gator Gateway," and a faculty-peer-advisor mentoring program.